The largest lake of Italy is Lake Garda, surrounded by beautiful landscapes, with a mild climate all year round, where you can admire from the shore villages, churches and villages, known towns of Bardolino, Garda, Sirmione, Desenzano and Riva del Garda touches the provinces of Trento, Verona and Brescia. Lake Garda is a tourist destination all year round thanks to the presence of accommodation with quality services for entertainment and sports that make this place an ideal destination for holidays on Lake Garda. The places most visited by tourists are Lazise, Garda, Bardolino, Torri, Brenzone, Limone, Hall, Desenzano, Peschiera, Sirmione and where every year, particularly in the summer, concerts are held, musical events, theatrical performances, food and wine events, art and athletes. 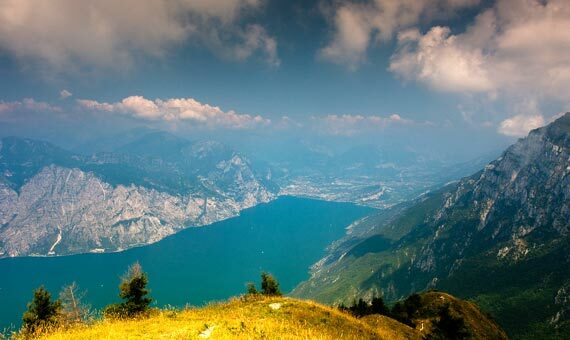 The Mediterranean climate allows visitors to go “cool summer” and “mild winters” enabling him to spend the holidays on Lake Garda making some beautiful walks, admiring along the banks, plants like palms, cypresses, oleanders, orange and lemon trees that give off a strong odor throughout. Olive trees and vineyards dominate the landscape of the eastern shore of Lake Garda where we produce oil and wine of excellent quality, including the popular wines like Bardolino, Bianco di Custoza, the famous Valpolicella and Soave wine.